El tema "Doing that scrapyard thing" interpretado por Cream pertenece a su disco "Those were the days (disc 2: studio)". 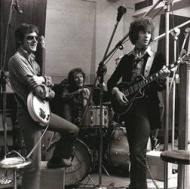 Ahora puedes escuchar y aprender la canción "Doing that scrapyard thing" de Cream. spent all my time inventing the cup of tea. balancing brass bands on the tip of my toe. i met three salads out on the motorway. balancing zepplins on the end of my nose. Escuchar Cream Doing that scrapyard thing Lyric Video.